How sad is the situation is when one of the main Australian coup-plotters, Senator Mark Arbib, is now trying to justify his position this in relation to the coup he mounted against then Prime Minister Kevin Rudd together with coup-leader Julia Gillard and fellow coup-plotter Bill Shorten plus others. What Arbib, a member of the Australian Labor Party's lunatic right faction, seems to have forgotten and conveniently left unmentioned are the facts behind Rudd's overthrow. 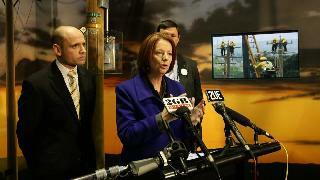 There is a message here though for coup-leader Julia Gillard. “When you sleep with dogs you are liable to get fleas”. When the ETS scheme, an ALP election promise, was knocked back in the Australian Senate by the Greens and the independents, Arbib and company advised Rudd to dump the scheme. When subsequently Rudd lost public support because of it, Gillard, Arbib, Shorten and non-elected Karl Bitar as well as other non-elected ALP party hacks mounted a coup against Rudd. As a reward for their deeds, all the coup-plotters in Parliament have since been made Ministers. The consequences of this coup are now well-known. Labor essentially lost the elections with the independents winning the balance of power, a hung Australian Parliament being the end result. The next couple of years in Australian politics will certainly be interesting. For Arbib to now do his ‘poor me' act is a total nonsense in my view. I think he should resign and go and annoy someone else rather than the Australian public. There is a message here though for coup-leader Julia Gillard. "When you sleep with dogs you are liable to get fleas". That being the case Julia Gillard must be doing a lot of scratching these days.